...We pray that the Lord will forgive the departed and we believe that the Spirit of God touches not only the living and those who pray, but also the departed. Our near and dear have passed on to the other world with passions, vices and sins and we pray and ask the Spirit of God, Whom God sent, we pray Christ the Saviour, that He will forgive them. The Ancestor’s Saturday for the commemoration of the departed on the eve of the celebration of the Holy Trinity at Pentecost is called Trinity Saturday. 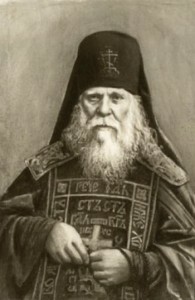 On the day on which the Church was founded, Holy Trinity Day, the grace of the Holy Spirit penetrated the whole Church on earth and the whole Church in heaven, where dwell ancestors and patriarchs, hieromartyrs, ascetics and saints. …We pray that the Lord will forgive the departed and we believe that the Spirit of God touches not only the living and those who pray, but also the departed. 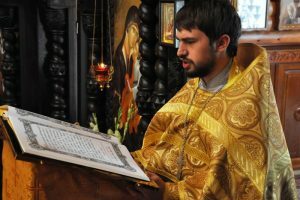 Our near and dear have passed on to the other world with passions, vices and sins and we pray and ask the Spirit of God, Whom God sent, we pray Christ the Saviour, that He will forgive them. On the eve of Trinity Saturday, Friday evening, our Church serves the Parastasis. Parastasis is the Greek word for intercession; during this service the prayer of the Church intercedes for the departed, and as the Lord Himself said, saves sinners. 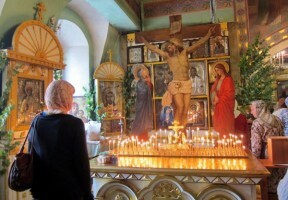 We plead from God forgiveness for the departed because they can no longer do anything for themselves, they can pray for us, but not for themselves: ‘O Lord, help and give rest to the souls of Thy departed servants, our forbears, fathers, sisters, brothers, the Orthodox who lie here and everywhere’. 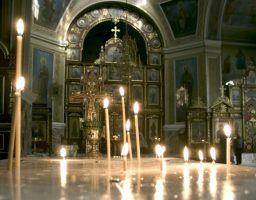 Orthodox ask on behalf of the Church that the Lord will have mercy on those who have passed away in the faith and hope of the Resurrection. Through the prayer of the Church, grace abounds to such an extent that it can even help departed souls escape from the bonds of hell. Many desire to commemorate their departed through lists of names, the priest reads them and says: ‘O Lord, remember him in Thy Kingdom’. Going to visit their graves, giving alms, doing good works, saying kind words are now all acts of mercy for those who have departed in an untimely way. Trinity Saturday is also called Ancestor’s Saturday because our ancestors are the closest to us in the flesh, which is why we begin by commemorating them. In the list of commemorations we first write the names of our departed parents, grandmothers, grandfathers, sisters, brothers and all relatives. The concept of an ‘Ancestors’ Saturday’ is linked with bonds of blood, of those near to us. Ancestors’ Saturdays grant us the joy of prayerful communion in God with those who have passed on from this life. This is why these days when we commemorate our parents, benefactors and relatives, are so loved. We go to the Liturgy, we give in our lists of names at the Proskomidia, we pray at memorial services. What else can we do for our dear departed? We can give alms abundantly, deepen our prayers for them at home and make the special commemorative dish, kutia. On this day Orthodox Christians may also go to cemeteries in order to honour the graves of their relatives after they have been commemorated in church. For when we pray for the souls of those have departed for the other world, it is considered that at that moment they too are praying for us in heaven.